Attack on Titan’s new season began on Saturday with more of the same, along with a few bombshells that failed to make up for the show’s poor pacing. If you’re already into Attack on Titan, you’ll love what the first episode is doing. If you aren’t a fan of the series, it doesn’t offer a compelling case to change your mind. 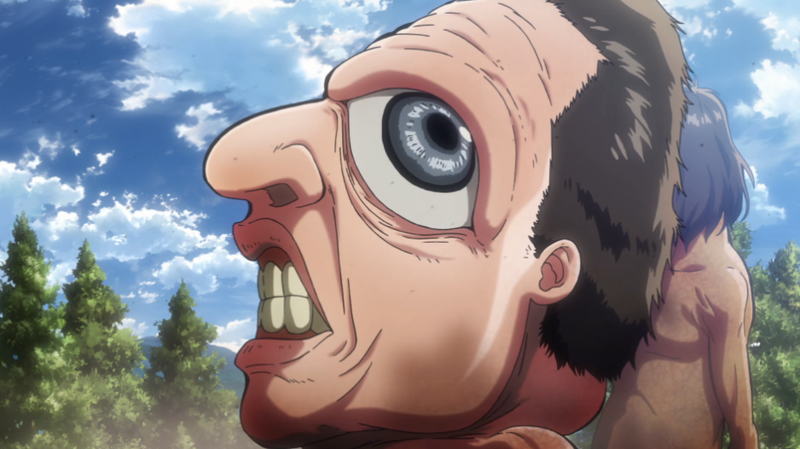 The second season premiered over three years after action-horror anime Attack on Titan’s naked, toothy giants achieved anime acclaim (and notoriety). It will only be twelve episodes long. In the show, humans fight for survival against the Titans, a race of enormous, deformed humanoids who, for mostly unknown reasons, pillage towns for humans to eat. To survive, the remaining humans live in enclosed, walled-off towns defended by the Survey Corps. In the first season, Eren, the protagonist, and his adopted sister Mikasa joined the Survey Corps after witnessing a Titan brutalize and devour their mother. 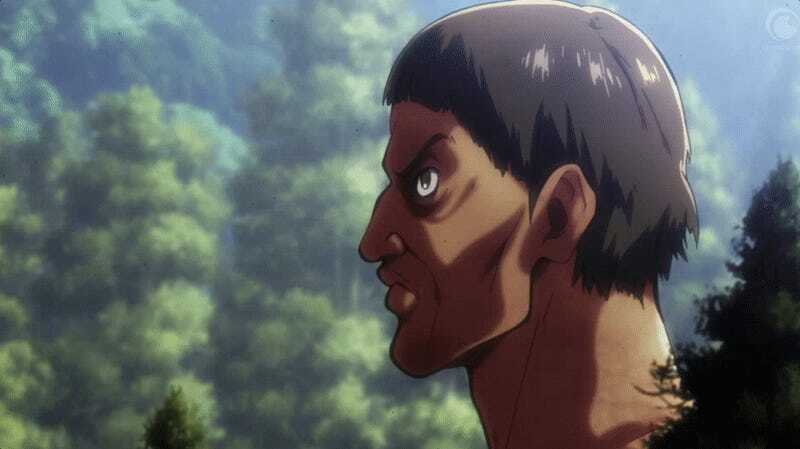 After 25 episodes of crackling, gushing limbs and bloody Titan teeth, Season One left off with Eren encasing his colleague Annie in crystal after she revealed that she was the intelligent female Titan who was massacring humans. In the first episode of Season Two “Beast Titan,” there’s a quick recap before a Survey Corps section commander interrogates a minister from the Church of the Walls, who seems to know more about the Titans than he’s letting on. It’s a tense opening that, like a lot of stuff that happens in Attack on Titan, will probably foreshadow something important once we forget about it. Before we talk about Season Two, I must confess that I do not, and never have, liked Attack on Titan. I understand its appeal: It’s a killer action anime with an exceptional fantasy world, where a fragmented human society is threatened by an enigmatic evil. The Titans’ misshapen designs—bug-eyes, blocky teeth—never fail to disgust me (in the best ways). Its animation is top-notch, with coloring and linework that amplify the series’ notes of horror and hopelessness. But despite all this, I find its reliance on plot backfill and Evangelion-derived character tropes boring. Its pacing is uneven and, essentially, the same thing happens over and over: A walled-off place that’s supposed to be safe is suddenly attacked by Titans. Lots of shows rely on structures like that, but they don’t skimp on the bread and butter like Attack on Titan does. Even with the plot’s twists and turns—like Eren transforming into a Titan—I can’t get into an anime so careless about how its own plot unfolds. Mostly-bleh characters and a strange reliance on backfill aren’t the best vehicles for a plot as good at Attack on Titan’s. Season Two’s first twist is that Titans are inside Wall Rose. 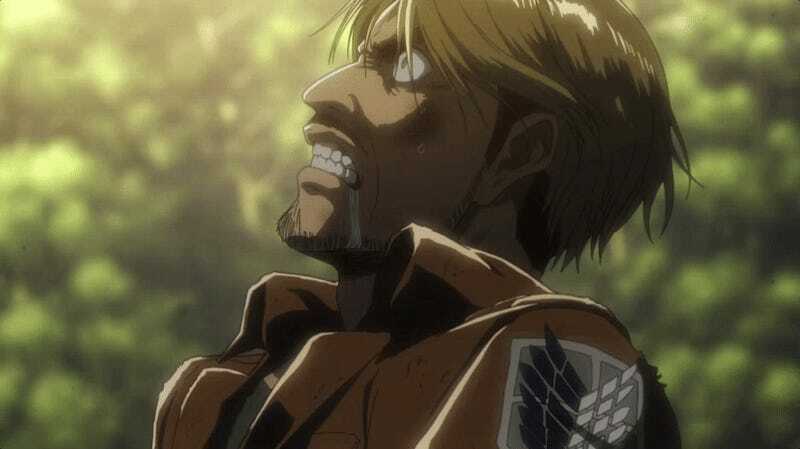 As a horse rides to inform a Survey Corps commander, we’re flashed back to “twelve hours earlier,” when, again, we learn that a Titan is attacking. Some outpost soldiers are sitting around, bored and complaining, when one of them hears Titan footsteps. It was a flashback I did not know we needed and that actually would have sufficed as the episode’s beginning. Then, we again learn that the Titans have broken through Wall Rose. Just after we see these new Titans, whose designs are just perfectly warped, we flashback to Eren’s childhood, and then forward again to contemporary Eren. The episode’s jagged storytelling made me wary of getting into any one scene. At any moment, it could be snatched from me and the momentum abruptly cut off. It was also confusing. By the time the humans actually got around to fighting the Titans, I was very ready for some bloodshed—at least I knew it would happen linearly. The episode certainly delivered on that front. Attack on Titan is nothing if not consistent, even in its missteps, and its action sequences are consistently metal. At one point, a Beast Titan, who is covered in fur, grabs a soldier’s horse as it runs by and just chucks at it at the soldier. It wasn’t as dynamic a combat sequence as we’ve seen, but there’s a mid-action plot twist that makes things pretty riveting by the end. That’s the trick—I’ll watch the next episode, albeit begrudgingly, because of those final few minutes. Tl;dr: If you like Attack on Titan despite its hop-scotchy storytelling and bland characters, you should be excited about where the second season is going. Its consistently good action and world-building are nothing to turn up your nose at. More of the same is what I expected, and sadly for me, I’m not sure what revelation or which character could get me into the series.